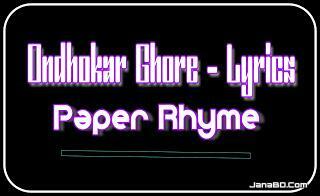 Home › Song Lyrics › Bangla Lyrics › Nikosh Kalo Ai Adhare (অন্ধকার ঘরে) - Song Lyrics || Paper Rhyme. Presenting 'Nikosh Kalo Ai Adhare' Soft Rock Song Lyric Which Composed By The Band 'Paper Rhyme' was formed in 1992. Their First Album was released in 1996 with the Band name. After the Superb Album, they discontinued their Band..
Song Name: Njkosh Kalo Ai Adhare. Your Departure God Not Gave Me.